A seminal map of Canada and the Great Lakes and one of the most important maps of the period. 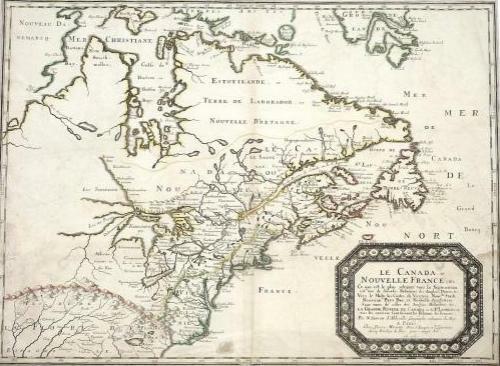 This map relied for its northerly information on the English and Danes, and for its delineation of the lower Atlantic coast on the English and Dutch; it was only for the "Grande Riviere de Canada," or Saint Lawrence, that French sources were preferred. The five Great Lakes are all now shown, though Lakes Ontario ("de St. Louys") and Erie ("Du Chat") still have their alternative names. Lake Superior is shown only at its eastern end, there being still no reliable information about its extent. Lake Michigan is even less well served, for Sanson is able to show only a fragmentary "Lac de Puans," the name which eventually became attached to what is now Green Bay in Wisconsin. The area round Hudson Bay is well shown, with a wealth of place-names that belied its eventual relative insignificance. Sanson also had reliable information about the English settlement in Virginia, but he was less sure about the line of what he calls the "Apalatcy Montes," or Appalachian Mountains, in the lower left corner. He shows these as running roughly east-west, instead of north-south, and as joining up with what looks like an extension of the Ozarks. Together they form a more or less impenetrable barrier between the Great Lakes area and the Gulf of Mexico; there was as yet no realization that a mighty river drained this whole central area and ran from the borders of Canada right down into the Gulf. In good condition, with minor toning and cut to to the borders. Minor flaws include scattered creasing, light dampstain at bottom right corner, tissue-backed split a few inches along bottom of center fold, a small mild stain at bottom from a sticker that had been on reverse, a small tear near left edge and a few other imperfections. But otherwise bright with good outline color. Not laid down, and does not appear to have been cleaned or otherwise restored.